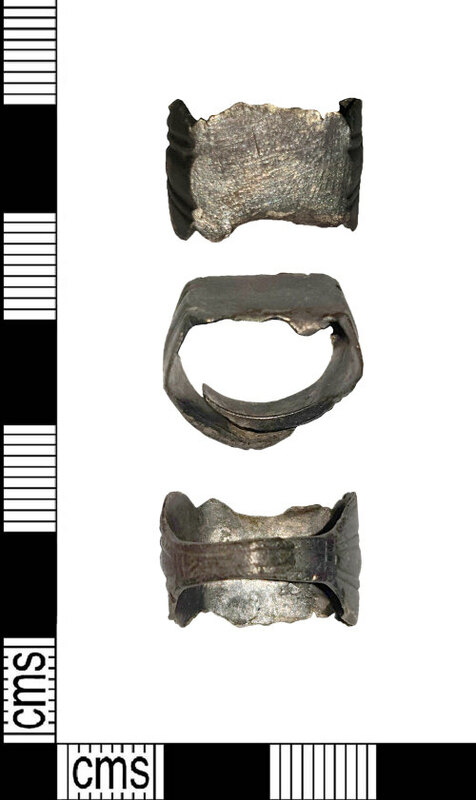 Treasure reference 2018 T741: a Roman silver finger ring, probably of Henig Type VIII which dates to the second or third century AD. The ring has a flat sub-rectangular bezel with sloping triangular shoulders. The shoulders taper to form a slender hoop. The bezel is very worn and no inscription or decoration is visible. The shoulders are each decorated with two pairs of incised lines which run parallel to the edges. These taper to the base of the hoop, where two lines continue along the perimeters. The hoop is not joined at the base, but rather overlaps at the centre. This does not appear to be a break, but instead may represent a method for adjusting the size of the hoop. The ring is probably a Henig type VIII dated to the 3rd century AD (Henig 2006, 4): many examples of this type have been recorded under the Treasure Act (1996), such as 2018 T268, 2017 T1118 and 2018 T565. The object contains a minimum of 10% precious metal and appears to be over 300 years old. Consequently, in terms of both age and precious metal content, it qualifies as Treasure under the stipulations of the Treasure Act 1996.